217 pages, paperback, 16 Black & White drawings, 146mm x 208mm. Published by Léonie Press, December 1998. After enjoying the first book about her family's experiences at St Paradis in rural France, Anne Loader's readers besieged her with requests for a sequel. "The Duck with a Dirty Laugh" is her response. It continues the story which began in the acclaimed 'A Bull by the Back Door' and covers the period from May 1996 to May 1998. The book is illustrated by Patricia Kelsall, whose beautiful drawings made such an impression on fans of the original book. Renovations to the Loaders' old stone farmhouse in the Limousin are going well but slowly, as Anne and Jack, her husband, tackle every aspect of the work themselves. They have promised Marguerite, the spirit of the former owner who made herself felt so strongly in the early days, that they will bring the place back to life but not change its character. She still seems to be with them as they get busy installing electricity, plumbing and drains - and doing some decorating. Old friendships prosper and new ones are made with French and Dutch neighbours, and with the delightful couple from whom the Loaders bought the house. Just when it seems everything is perfect in France, at home in England Anne's mother is cruelly afflicted by Alzheimer's Disease and the family are thrown into a state of constant worry and unbearable sadness. They face a period when just "hanging on and surviving" is the simple goal. Their first test at St Paradis is immediate. They have to cope with the coldest weather in Europe for a century, when it's -12 degrees outside and 1.6 degrees in the kitchen, the water is frozen, it's snowing hard and everyone in the hamlet is ill. The book covers happier times too, of course, and introduces new characters, both animal and human. We meet the dogs of the hamlet, including the cheeky Milord who regularly sneaks into the kitchen to make his mark with a quick pee, the sad mule with a sore head, and The Duck with a Dirty Laugh who tells rude jokes to his friends on the pond. We follow Anne and Jack through the tenth anniversary celebrations of their Cheshire village's twinning with Mornant near Lyon, and see through their eyes how Princess Diana's death is received in France. There are visits to the local horse fair and to the beautiful church in St Paradis where every inch of the walls and ceiling is covered with stencilling or painting (and one of the carved cherubs looks just like Margaret Thatcher). Anne says: "The period covered by the book was certainly not one of the easiest in our lives but it would have been dishonest to have pretended that everything was idyllic. Nevertheless, for most of the time, St Paradis was a welcome haven where we could go to recharge our batteries. Our experiences there underlined that it is the simple things, like friendship and mutual caring across cultural and language divides, which are the most important." Demand for further news of life in St Paradis has continued and so Anne's third book in the series of what has now become the St Paradis saga, "The Bells of St Paradis", was published in December 2001. Anne Loader started in journalism in 1965, with East Midland Allied Press in Lincolnshire and Norfolk. After her marriage she worked as a reporter on the Southern Evening Echo at Southampton. She was the feature writer on Northwich World from 1980-84 and was editor of the Crewe Guardian for ten years until 1995 when she was made redundant. She now runs a business publishing short-run books on autobiography, France and local history. Anne wrote this book as a sequel to "A Bull by the Back Door", to satisfy all the demands from readers to know what happened next. 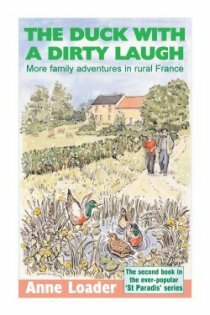 Anne's third book of the series about the Loaders' experiences in deepest rural France, tentatively called "The Turkey who sang the Angelus", arrived in December 2001 (around doing books by other authors) as "The Bells of St Paradis". Patricia Kelsall is a professional artist and a part-time art lecturer. She has exhibited in various parts of the country including the Royal Academy, and also in France. The two friends, who both live in Hartford, Cheshire, share a love of France and have been involved with the Hartford-Mornant twinning since it began in 1987.